While all eyes are on a likely Turkish land incursion against the Kurdistan Workers’ Party (PKK) in northern Iraq, Turkey faces the prospect of another security and ideological challenge in the Kurdish hinterland across its border, this time in Syria. Syria’s 1.8 million Kurds (10% of the population) have arguably been the most quiescent of the Kurdish populations of the Middle East as a result of the hard hand of the state and the tentacles of its security apparatuses. They have also experienced some of the most restrictions on their political and cultural rights in an Arab nationalist state that denies their identity. At best they are second class citizens, at worst persona non gratis. However, the general uprising in Syria against the regime of Bashar al-Assad has been a game changer and the Kurds have entered the protests on the side of reform, calling for the ouster of Assad and the recognition of their political and cultural rights. “The Kurds were the first to demonstrate in 2011, as they have demonstrated in January 25th in Hasakeh and were locked up, while their areas in Aleppo were under heavy military presence,” notes Syrian dissident Ausaman Monajed. However, the Syrian Kurds are divided into over a dozen illegal Kurdish parties that have been unable to organize and agree amongst themselves, much less between a fractured Arab opposition in Syria and the diaspora. The Assad regime has been able to play the proverbial Kurdish card, stoking fear amongst Arabs of Kurdish separatism while trying to divide the Kurdish opposition. There is even suspicion the regime has infiltrated some of the Kurdish parties. All this would suggest that just as the Arab street is at the forefront of the protests, so too are their Kurdish counterparts. The Syrian uprising comes at a particularly difficult juncture in Turkey’s own Kurdish problem. First announced in 2009, the Justice and Development Party’s (AKP) “Kurdish Opening” – which aimed to deemphasize the security focus of the state’s Kurdish policy in favor of the expansion of Kurdish political and cultural rights — has come to a standstill. The government has reached a political impasse with the pro-Kurdish Peace and Democracy Party (BDP) following the June 12th election. The BDP is boycotting parliament over the arrest of six elected MPs for their alleged membership in the Kurdistan Communities Union (KCK), claimed to be the urban arm of the PKK. Reinforcing the Turkish state’s security-focused policy towards the Kurds is the rising violence between the PKK and Turkish security forces. This summer the conflict has claimed the lives of over 40 Turkish soldiers, in addition to nearly 160 PKK guerrillas. All this bodes poorly for the soon-to-open negotiations on writing a new civilian constitution that many observers expect to resolve some of the foundational issues between the state and its Kurdish minority. In Syria, Ankara is concerned over the PKK and its links to the Syrian Kurds, most notably through the PYD (Democratic Union Party), an offshoot of the PKK in Syria. “The PKK is active in Syria under the guise of the PYD, with an extensive network and a lot of clout amongst the Kurdish population in Syria. New PKK members are regularly recruited in Syria and then smuggled across the borders [of Iraq and Turkey],” says Sinclair. Instability in Syrian Kurdistan could open space for the PKK to operate, posing a particularly difficult challenge for Turkey – including the use of the Syrian Kurds or the PKK as proxies in the inter-state rivalries of the region and the struggle for influence in Syria. In the 1980s and 1990s, Syria was the PKK’s largest patron and harbored the PKK’s leader Abdullah Ocalan. However, Syria ended its support for the PKK in 1998 following Turkish threats of military intervention. Since then Syria and Turkey have co-operated against Kurdish nationalism, driven in large part by mutual concern that Kurdish political gains in post-Saddam Iraq would have a spill-over effect on their own Kurdish populations. Indeed, as the pace-setters of Kurdish nationalism the gains of the Iraqi Kurds in post-Saddam Iraq have had an influence on the Syrian Kurds. In 2004, riots broke out between Kurds and Arabs in Qamishli after the Iraqi Kurds declared autonomy. 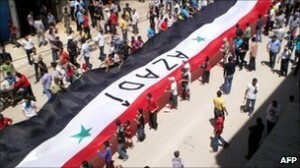 In the ensuing crackdown Syrian security forces killed 34. The regime has since kept a tight lid on all Kurdish political, cultural and social activity. However, as the Syrian uprising enters its seventh month the lid on the Kurds has boiled over. This has caused concern in Ankara over what the regime’s end-game may look like as well as the nature of a post-Assad Syria and the position of the Syrian Kurds within it. The problem for Turkey is that the Syrian Kurds, like their brethren in Turkey, demand language rights, constitutional recognition of the Kurds as an ethnic group and, for some, autonomy. While these demands may have been muted under the iron fist of the Assad regime and the fractured nature of Syrian Kurdish politics, they are now coming to the fore, pitting Syrian Kurds against Arab nationalism, and possibly the Turkish state. A native of Seattle, Chase earned his BA in International Studies and MA in Middle East Studies from the University of Washington. He lived nearly four years in Turkey, where he studied as a Fulbright Scholar, Boren (NSEP) Scholar and Fellow, Critical Language Scholar, and American Research Institute in Turkey Fellow. While in Turkey he studied at Bogazici University, Sabanci University, the Kurdish Institute of Istanbul, and conducted independent research. His areas of interest include Turkish politics, Turkish foreign policy, the Kurdish issue, and the Middle East. He is fluent in Turkish and knows Kurdish. Chase currently lives in Washington, D.C., where he works as the Turkey editor for Southeast European Times and SES Turkiye.